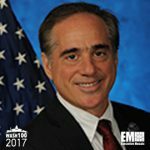 Executive Mosaic is pleased to announce David Shulkin, secretary of the Department of Veterans Affairs, as an inductee into the 2017 edition of the Wash100 — Executive Mosaic’s annual selection of influential leaders in the government contracting arena. Shulkin was confirmed by the Senate through a unanimous vote in February and has pledged to lead the VA’s reform and transformation efforts, as well as help boost veterans’ access to healthcare services in the private sector. “Should I be confirmed, I intend to build an integrated system of care that would strengthen services within the VA that are essential for veteran well-being and use services in the community that can serve veterans with better outcomes and value to the taxpayer,” Shulkin said. Prior to his appointment as VA secretary, he served as the department’s health undersecretary and prior to that held leadership roles such as president of the Morristown Medical Center, CEO of the Beth Israel Medical Center and chief medical officer of the Temple University Hospital. During his stint as VA health undersecretary, Shulkin worked to foster integration between the department’s electronic health record and private sector providers to boost veterans’ access to medical care. He pushed for the VA to help finance treatment offered at private medical facilities for veterans in addition to ongoing efforts to provide healthcare services in department facilities to cater to the number of patients queued for medical treatment. Under Shulkin’s leadership, VA also launched new efforts to provide veterans with access to primary and mental healthcare services as well as increase the number of medical centers that have the capacity for same-day appointment services. Executive Mosaic congratulates David Shulkin and the Department of Veterans Affairs team for his selection to receive this award.